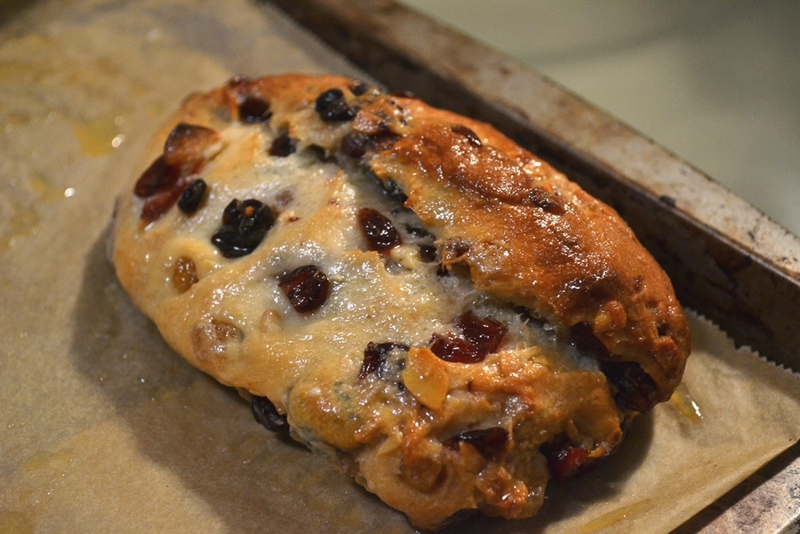 Last year I made a big Christmas Stollen and it didn’t quite turn out the way I liked it, e.g. it was a bit too dry. So this year I thought I would try my hand with a mini version and see how that goes. Besides, I am looking for recipes for the baking and cooking club again (Kochlöffel & Nudelholz: Canadian-German Back- und Kochstudio). We will have a Christmas Family Event December1, between 2 p.m. and 6 p.m. Anyway, this recipe will give you 8 little Christmas Stollen and thus is perfect to give one of those away and still have some left for yourself. A full Christmas Stollen is pretty big and takes some time to eat, if you are only two people in your household it might take you till January. The recipe comes from the Backen ist Liebe: Weihnachtsgebäck (Baking is Love: Christmas Baking), publisher is Südwest, page 92-93. Tip 1: I found that the fruits and nuts was too much for the amount of dough. I would recommend to reduce the amount by at least 1/3. Tip 2: If you don’t like currants or raisins you can substitute them with other red fruit, just make sure you dice them small enough. Tip 3: The recipe asks for 350g of butter but only 1/3 goes into the dough. I recommend that you divide the butter before hand and only melt 1/3. Prepare fruits and nuts one day beforehand! Dice almonds and ginger and big pieces of fruit. 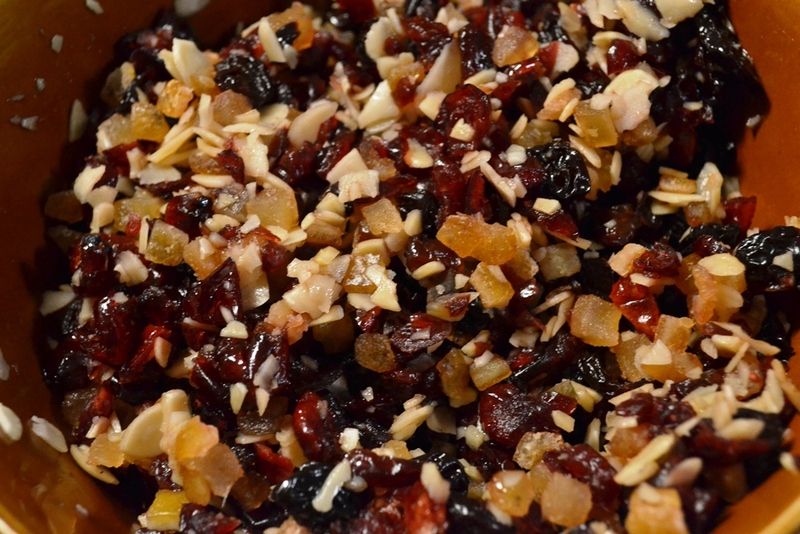 Combine almonds, ginger, raisins, currants (or other fruits) with the orangeat and citronat, then add the rum and ginger syrup and combine well. Cover the bowl with a plastic wrap and let it sit for a day. The next day the rum and syrup will be incorporated nicely into the fruits which will give the Christmas Stollen a good flavour. Prepare the yeast by heating the milk slightly, warm to the touch, and mix 1 tsp. sugar into it and then add the yeast. Let it stand in warm place until it bubbles and is foamy. While you wait you can measure the ingredients. Add the yeast to the dry mix and knead until you have a soft dough. I would recommend to let a kitchen machine do the first kneading. This way you have more control over the dough and the machine kneads more consistently. You may need to add more milk if the dough is too dry or a bit more flour if the dough is too sticky. Transfer the dough into a bowl greased with oil, it will be easier to remove. Cover it with plastic wrap and then let it sit in a warm spot for 1 hour. I usually place the bowl on top of my oven while it is heating. The dough should have doubled after that our and now you can incorporate the nut/fruit mix. Cover again and let it rest for another 30 min before you divide the dough into 8 pieces. Then you need to form a Stollen. 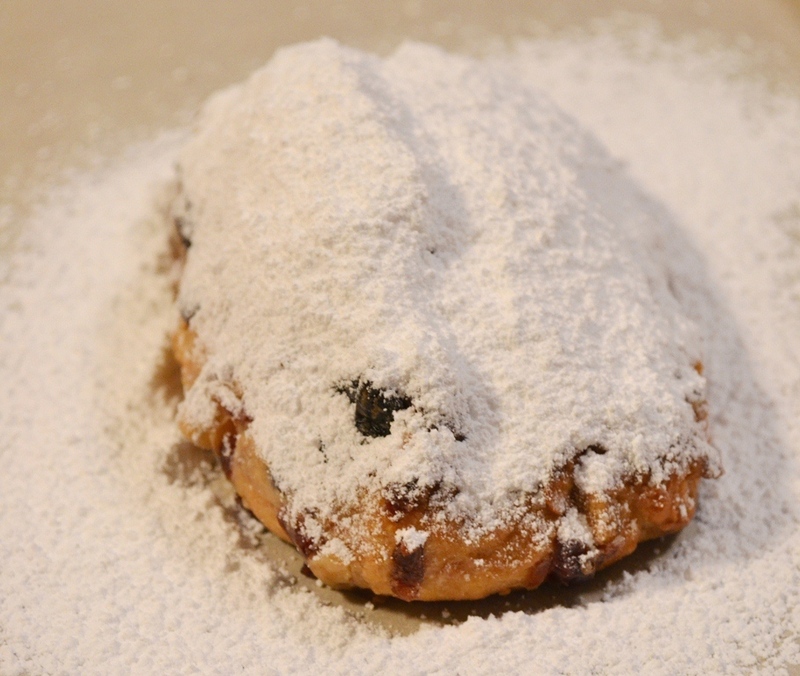 This video will show you how to do it: Omi’s Stollen. Start watching at about 6:45 min. 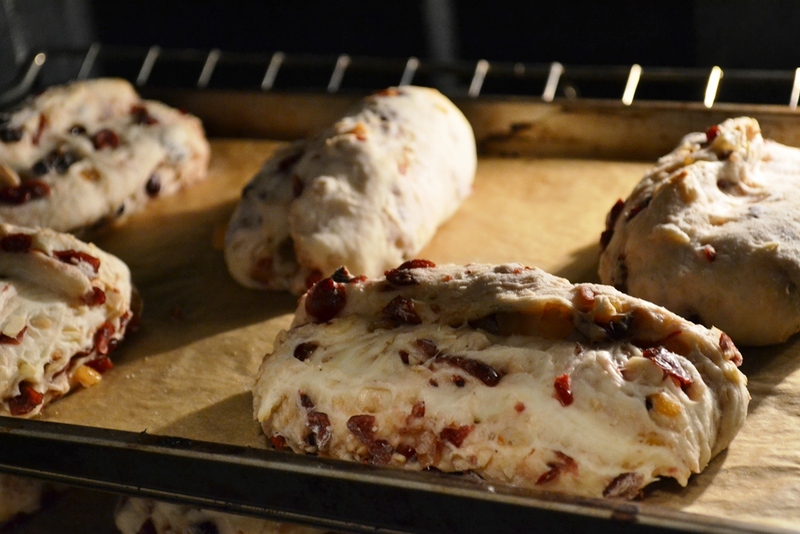 Once you have the form, place the 8 Stollen on baking sheets and bake at 170°C for about 40 min. You will need to check in between, if they are browning quickly spray with water and cover with aluminum foil. Check if the Stollen is done by knocking on it. It should sound sort of hollow. Remove from the oven and brush with the rest of the butter (melted). Let it cool of slightly before transferring each Stollen onto a good sized piece of parchment paper. Sift a good amount of icing sugar over it and wrap each Stollen. Let them sit until completely cool and then put them into a plastic bag. 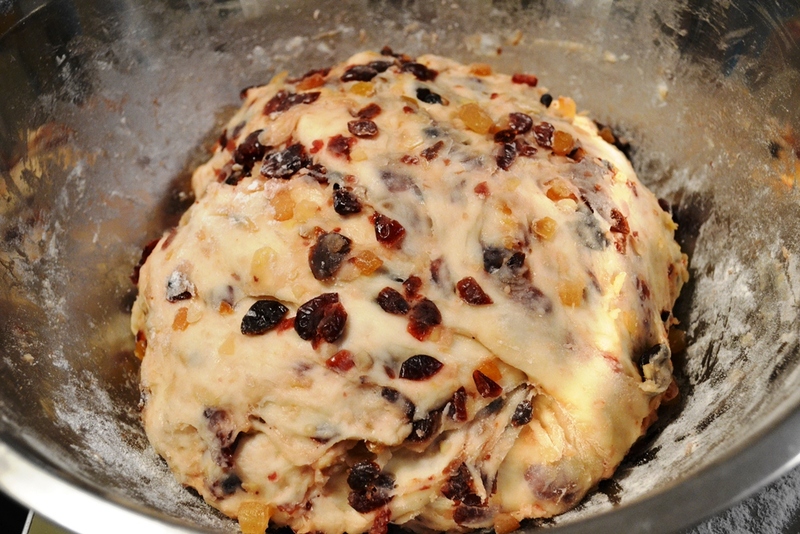 The Christmas Stollen should sit for several weeks before eating so that all flavours can come together. These are beautiful! My husband’s mother was German, and we try to do several German things every Christmas. I am going to add this to the list.